Q: What was the concept behind the GRANDE PRO - VOLUME 2? A: The vision was to develop ​new textured pigments crafted in the traditional hand-pressed format that transcend dimension and diversify payoff and reflectivity in a wide range of hues, all while keeping to the incomparable quality and expectations of the VISEART connoisseur. Q: Is this a new palette design for VISEART? 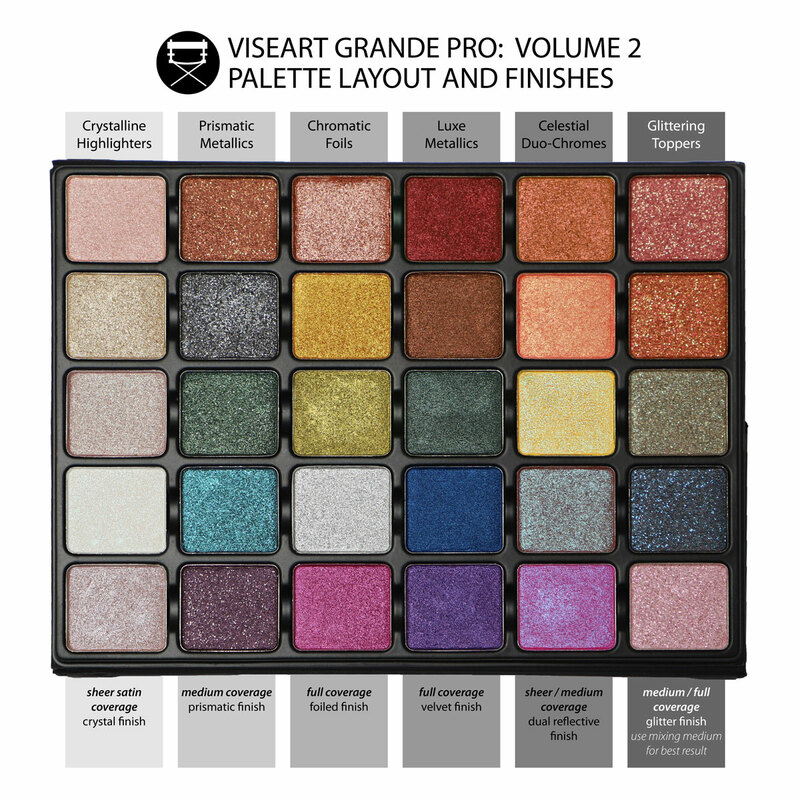 A: This palette follows in the unique design of the GRANDE PRO - VOLUME 1 and the THEORY PALETTES. The palette is stream-lined without the bulk or weight of unnecessary packaging and folds open into a working easel with a full-sized mirror. Each shade is individually magnetized for easy removal and customization. Q: Why all textured shimmering pigments? A: VISEART's iconic matte formulation has become the industry standard with a current collection of over 150 beautiful matte shades. VISEART created a new range of textured hues from prismatic metallics to chromatic foiled finishes to work on their own and in conjunction with their iconic matte shades. Q: How many shades are new? A: All 30 shades, divided into 6 new formulas, are NEW to the VISEART collection. Q: Why 6 different formulas? A: When working with prisms and glitters in a powder based formula, each shade required a different pay-off of pigment depending on the desired finish and reflectivity. For some shades, light must be able to travel through the pigments to allow the reflective particles to radiate. In addition, having diversity in the opacity of the shades allows artistic pairings between shades creating a beautiful, dimensional movement for color. Q: What are the differences between the 6 new formulas? A: COLUMN 1: The Crystalline Highlighter is a sheer satin formula designed with a multi-layered crystal fleck ideal for highlighting eyes or cheeks. COLUMN 2: The Prismatic Metallics are a medium to full coverage reflective formula layered with a larger prismatic fleck. COLUMN 3: The Chromatic Foils are a full coverage formula created with a highly reflective, polished finish. COLUMN 4: The Luxe Metallic formulas are medium to full coverage with a rich jeweled-tone pigment payoff. COLUMN 5: The Celestial Duo-Chromes are a sheer to medium satin formula designed with a dual-colored prism creating a transcendent movement of color. COLUMN 6: The ​​Glittering Toppers are a sheer to buildable matte formula with a large glitter complex ideal for layering on the center of the lid, inner corner of the eye, or lips. This formula is recommended for use with a shadow transformer or sealer to set the reflective particles and maximize textured reflectivity. Q: What is the best way to work with the new textured pigments? A: For optimal wear, using a shadow primer before application or dampening a brush with a shadow transformer or sealer will add extra hold to the reflective particles, giving maximum reflectivity and wearability. Applying the pigments with a patting technique opposed to sweeping will ensure the best application. Q: What is the best way to work with the Glittering Toppers (Column 6)? A: We recommend using the Glittering Topper shades with a shadow transformer or sealer for a wet to dry application. This will minimize glitter fall out and ensure longevity. Q: What are the best type of makeup brushes to use with the GRANDE PRO - VOLUME 2 formulas? A: Working with a natural textured, filbert shape makeup brush will give more control in application. We recommend the ESUM Sable Series in W21, W23 or W25 to apply color. The ESUM S31, G27, and G29 will work well for bending and diffusing color. 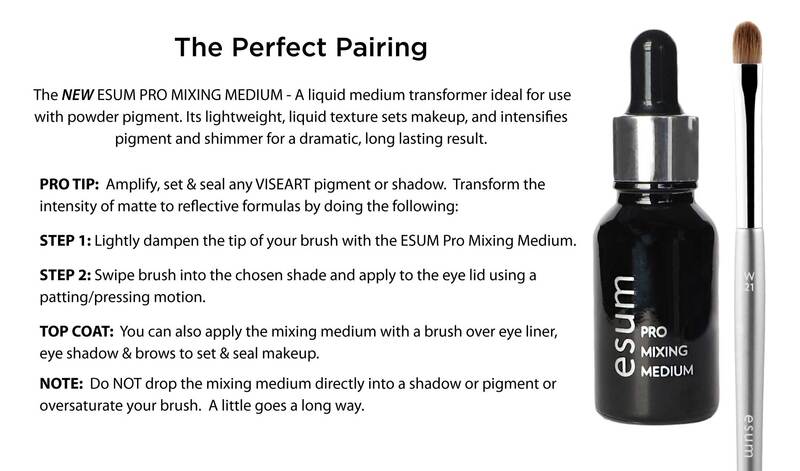 For vegan brush alternatives, use ESUM T37 or T38 to apply color and ESUM T39 to diffuse color. Q: What size are the shade pans? A: Each shade pan is the same size as all VISEART PRO and THEORY PALETTES - 2g / .07oz each. Additionally, each pan is magnetized, making it ideal for makeup artists who want to edit down their favorite shades into smaller collections or the maven for endless customization. Q: Why numbered limited edition? A: We wanted to denote the collectable nature of this edition and personalize every palette with a handwritten number for each makeup artist and enthusiast. In addition, the price point is set at a special value as a thank you to VISEART fans. Q: Will this item be launching at other retailers in the US? A: The numbered collector's edition palette is launching exclusively with MUSE BEAUTY.PRO with only 3000 numbered pieces. Q: Will MUSE BEAUTY.PRO ship this palette world wide? A: Yes, world wide shipping is available for the GRANDE PRO - VOLUME 2.